Welcome To the Dark Side!... I grew up with the Amstrad CPC, and I started learning Assembly with the Z80, however as my experience with Z80 assembly grew, I wanted to start learning about other architctures, and see how they compared! These tutorials will be written from the perspective of a Z80 programmer learning 6502, but they will not assume any prior knowledge of Z80, so if you're starting out in assembly, these tutorials will also be fine for you! In these tutorials we'll start from the absolute basics... and teach you to become a multiplatform 6502 monster!... Let's begin! Beginners Series - lets learn the basic 6502 commands by example! Lesson 6 - Defined data, Aligned data... Lookup Tables, Vector Tables, and Self-modifying code! Platform Specific Series - Now we know the basics, lets look at the details of the platforms we're covering! The 6502 is an 8-Bit processor with a 16 bit Address bus! 6502 is 8 bit so it's best at numbers less than 256... it can do numbers up to 65535 too more slowly... and really big numbers will be much harder to do! - we can design our game round small numbers so these limits aren't a problem. Compared to the Z80, two things are apparent about the 6502... firstly the stack pointer is only 8 bit... and secondly we have very few registers! The 'solution' to the lack of registers is special addressing options... the first 256 bytes between &0000 and &00FF are called the 'Zero Page', and the 6502 has many special functions which allow data in this memory range to be quickly used with the accumulator and other functions as if they were 'registers'! With VASM you do not need to put a # where it is always a number, like on jump commands or data declaractions like "DB $3" or "BRA 3"
Because the 6502 has no 16 bit registers, it's often nesassary to split an address into its High and Low byte parts, by prefixing a label with < or > it's low or high bytes will be extracted and used in the compiled code, lets take a look! In some cases, there are tricks we can do to 'quickly' test a bit! Important commands that don't exist! The 6502 lacks some surprisingly common commands that other processors have, but we can 'fake' them with the commands we do have! Pretending we have 16 bit! 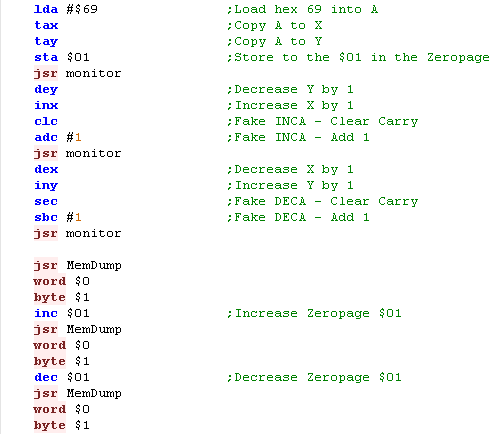 We can use Zero page pointers to fake the Z80's 16 bit operations! I Learned Assembly on the Z80 systems, and the 6502 seemed strange and scary!... but there's really nothing to worry about, while you have to use it a little bit differently, programming 6502 is no harder than Z80! Lets start from the basics and learn how to use 6502! 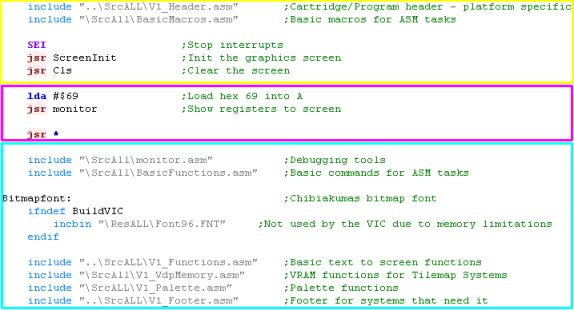 In these tutorials, we'll be using VASM for our assembly, VASM is free, open source and supports 6502,Z80 and 68000! We will be testing on various 6502 systems, and you may need to do extra steps (such as adding a header or checksum)... if you download my DevTools, batch files are provided to create the resulting files tested on the emulators used in these tutorials. 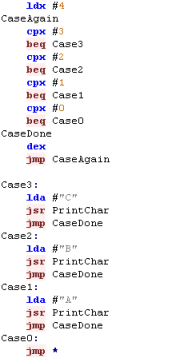 We will look at ALL of this code later, in the Platform specific series... but we can't do that until we understand 6502 itself! 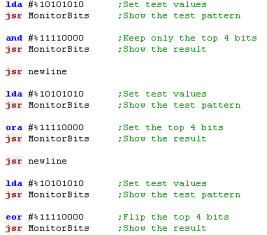 We will then call the 'Monitor' function - which will show the state of the CPU registers to screen! in this way, whatever the 6502 system you're learning and what emulator you're using, we'll be able to do things in a common way! Of course if you want to do everything yourself that's cool... We're lerning the fundamentals of the 6502 - and they will work on any system with that processor... but you'll need to have some other kind of debugger/monitor or other way to view the results of the commands if you're going it alone!... Good luck! X and Y are our other 2 registers... we can use them as loop counters, temporary stores, and for special address modes... but we'll look at that later! Lets learn our first commands... LDA stands for LoaD A... it sets A to a value... we can also do LDX or LDY to load X or Y registers! Take a look at the example to the right... we're going to load A, X and Y... but notice... we're going to load them in different ways... A will be loaded with #$69... X will be loaded with #69... and Y will be loaded with 69... what will the difference be?? Y=0... why? well when we don't use a # the assembler gets the memory address.... so we read from memory address decimal 00069!... of course we can do $69 or $0069 to read from address hex 0069 too! 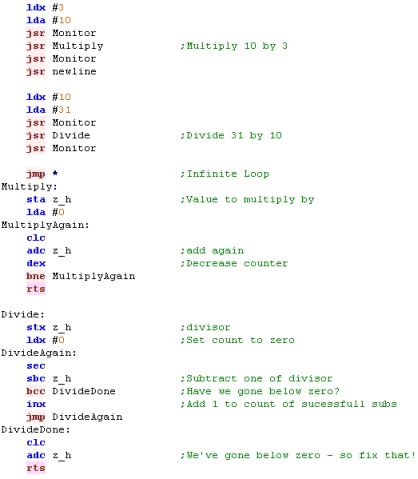 Here are all the 6502 Assembler ways of representing values, and how they will be treated. 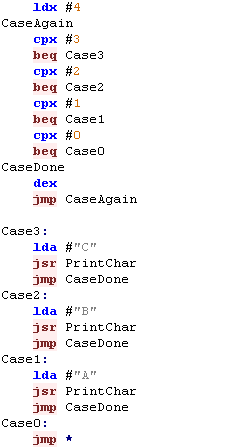 In this case that command is 'JMP *' which tricks the 6502 into an infinite loop! JSR in 6502 is the equivalent of GOSUB in basic or CALL in z80.... we'll look at how to make our own subroutine in a later lesson! This causes the 6502 to jump back to the start of the line... so it ends up running the jump command forever!... it's an easy way to stop the program for testing! The Carry is a single bit which is the overflow from a previous calculation... you see, in 8 bit maths you can't go over 255... so if you set A=255, then add 1... then A will become Zero, but the Carry will be 1... effectively the Carry is the 9th bit! Don't worry if you don't understand that now... the important thing is we need to deal with the carry before we try to add or subtract with ADC and SBC! 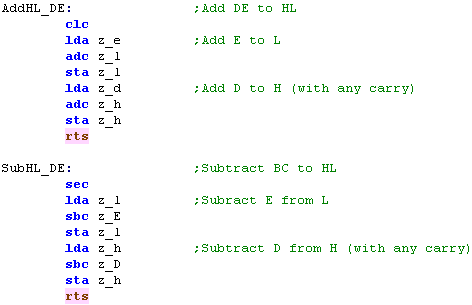 However strangely if we don't want the Carry to affect subtraction, we have to SEt the Carry with SEC... before the SBC command - this is the opposite of the z80 command, but it's just the way the 6502 does things! Here is the result... you can see we go from 15, to 16, then back to 15! Well, we can use TAX and TAY to Transfer A to X...or Transfer A to Y! We can also use TXA or TYA to Transfer X to A... or Transfer Y to A! 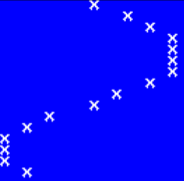 Then we transfer A to X... and Y to A... the result is shown on the second line. Remember we learned that using LDA with a number without a # means it will load from that numbered address? - so LDA $13 will LoaD A from hex address $0013? Well we can also STore A with the STA command!... we can also STore X with STX, or Store Y with STY! 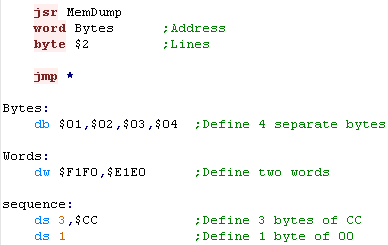 When it comes to showing the result, we'll use another debugging subroutine I wrote called MemDump... this will dump a few lines of data to the screen... in this case we'll show 3 lines (of 8 bytes) from memory address $0000-$0018... In this example, we'll show the memory before, and after we do the writes. * Warning * If you're not using my sample code, these commands may overwrite system variables - and cause something strange to happen! Want to try something else?? Why not change CLC to SEC and ADC to SBC... and see what happens! 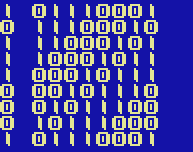 The first 256 bytes of memory $0000-$00FF are special on the 6502... in fact there's a lot we're not mentioning about reading and writing memory... but it's coming soom! 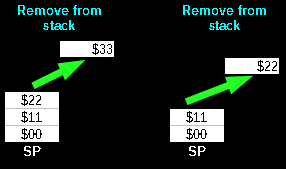 Also the memory from $0100-$01FF is also special... it's used by the stack!... don't know what that is? don't worry... we'll come to that! Why? because it's not actually a 6502... its a HuC6280... it's almost the same as a 6502... but it has some extras and weirdness! The 6502 has very few registers - but it makes up for this with a mind boggling number of addressing modes! You won't need them all at first, but you should at least understand what they all do - lets see some examples of how they work! Lets try them all out with some simple examples! 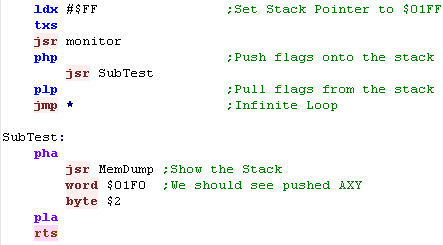 In order to run these examples we're going to need to set up some areas of memory, by filling them with test values. 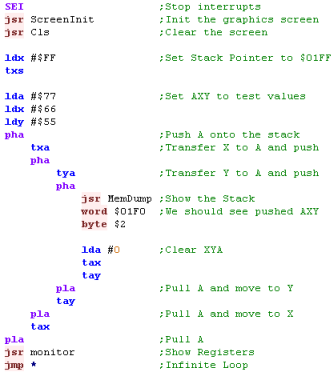 The code to the right will do the work (via a Function called LDIR - which copies memory areas)... don't worry how it works for now, it's too complex at this time! Here is the rest of the Chunk copying code, and the data copied... again, you don't need to worry about this for now. Here is the important bit... THIS is the data as it appears in memory when the program runs... you may want to refer back to this if you wish! Note: These tutorials will not work on all systems... for example most will not work on the PC engine, because the zero page is not at &0000! They may also not work on the NES or SNES, because the &2000 area has a special purpose on those systems. They have all been tested on the BBC.... but don't worry... the theory shown here is based on the principals of the 6502 - so will work on ANY 6502 based system! We'll be reading in all these examples... but many of the commands can be used for other commands.. please see the Cheatsheet for more details. This means the code will be 'relocatable' - we can move it in memory and it will still work, but we can't jump more than 128 bytes! BCC ALWAYS takes a fixed number (not an address), so we don't have to use # with BCC in vasm!... 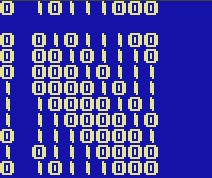 that said, we can just use labels (names that appear at the far left, and let the assembler work out the maths. 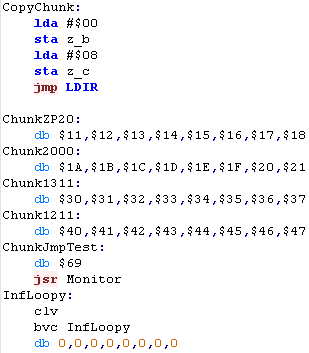 The "Program Counter" (shown as P) stores the byte of the end of the last command.... A "JSR Monitor" takes 3 bytes, "BCC 3" takes 2... hopefully the numbers the program counter shows will now make sense if you add up the commands! Accumulator addressing sounds more complex than it is! For Example LSR shifts the bits to the left... don't worry if you don't understand it, we'll look at it later! As we've already learned... we can use # followed by $ to sepcify a hexadecimal number. In this example we will add Hex 10 and Hex 20... the result is obviously 30! Why not try using different numbers,remove the $ to stop using hexadecimal..., or SBC... don't forget to change CLC to SEC if you do! Because the address is stored as a single byte - it's fast, and the Zero page can do things that other addresses cannot! 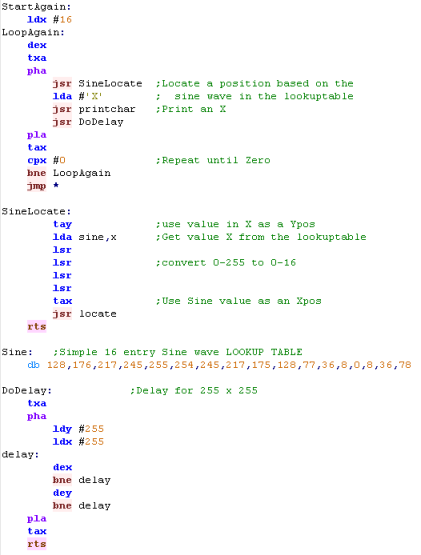 The 6502 uses this 'zero page' like a bank of 255 registers - allowing the 6502 with it's just 3 registers to do the things the Z80 did with over a dozen! We can use different numbered addresses for different purposes, but many may be used by the machines firmware! 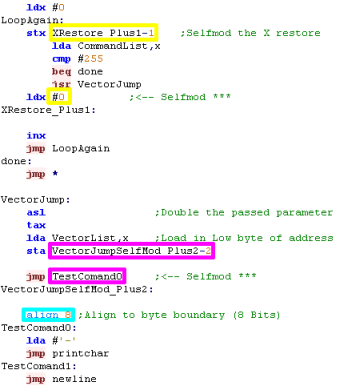 Note... LDA $20,Y is not a valid command... however the assembler will covert it to LDA $0020,Y which IS... but it takes an extra byte, so is not as efficient! take a look at the values we wrote to the Zero Page at the start, and try changing X,Y and the source location ($80) to other values. Absolute addressing is good for variables we're not storing in the zero page (often most of the Zero page is used by the firmware!)... but isn't very good for reading in lots of data (like sprite images)... for that we want indirect addressing - which we'll look at soon! When we want to read from multiple addresses, we can used Indexed addressing... this adds X or Y to an address - so we can change X/Y to read in from a range using a Loop!... we'll learn how to do a loop very soon! $xxxx,Y can be used with many commands, but $xxxx,X has more options... check out the cheatsheet for more info! Changing X and Y allow you to change the source address without changing the LDA line.... we'll learn how to do this in loops and functions later. 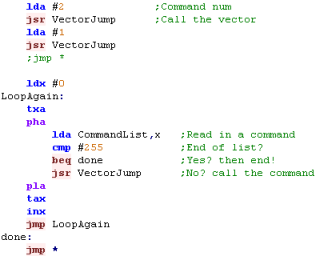 We can directly read a 16-bit value from another 16-bit address ($0000-$FFFF) In one special... the JuMP command (for all other cases we need to use the zero page. This can be used to reprogram parts of your progam - allowing alternate routines to be 'switched' in. This is how we get around the 6502's lack of registers!... don't worry about it if you don't understand yet... we'll see this a lot later! In this example we've got X set to 1... so we end up loading a byte from the address made up of bytes at $0081 and $0082 - remember they are in reverse order because it's little endian! we then show the result to screen.... of course setting X to 0... and changing $80 to $81 would have the same effect. Post-Indexed with the Y register also use the Zero Page... two concecutive bytes are read in from the Zero page to make an address... but the Y register is then added to THAT address... and the final value is read from the resulting address. Effectively it's the same as Preindexed when X=0... or PostIndexed when Y=0... this is how we can simulate this addressing mode if we need to do this on the other machines! It would be nice to have this mode on the other CPU's, but we don't... however we can simulate it! Of course you're free to use them if you wish, just remember - it will mean you can't port your code to another system as easily! 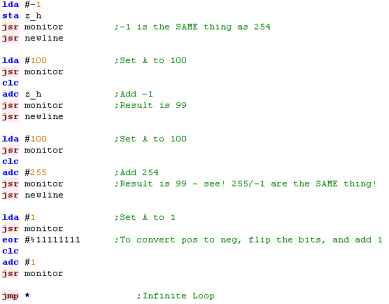 We've had a breif introduction to 6502, and now we understand the Addressing modes we can look properly at 6502, lets take a look at some more commands, an how to do 'IF Then' type condions and Loops! We've been cheating a little, we've overlooked a few important commands - they're hidden in the header, but we really need to know them!... before we start the proper lesson, lets look at them now! We're going to need to know ALL the details of assembly to create a working program, and something have been hidden until now! but we need to ensure we know everything. to the right, you can see how the code will compile - this is the 'Listing.txt' file, showing the source code and the resulting binary output. Interrupts are where the CPU does other tasks whenever it wants! For simplicity at this stage, we want to stop that, so we use SEI to "Set the Interrupt Mask"
Symbols are similar to labels... they allow us to give 'name' (like TestSym) a 'Value' ... rather than using the value later, we can just use the symbol... Using symbols makes it easy for us to program, as we can use explainatory text rather than meaningless numbers. Branches allow us to do things depending on a condition... we can use this to create a loop! 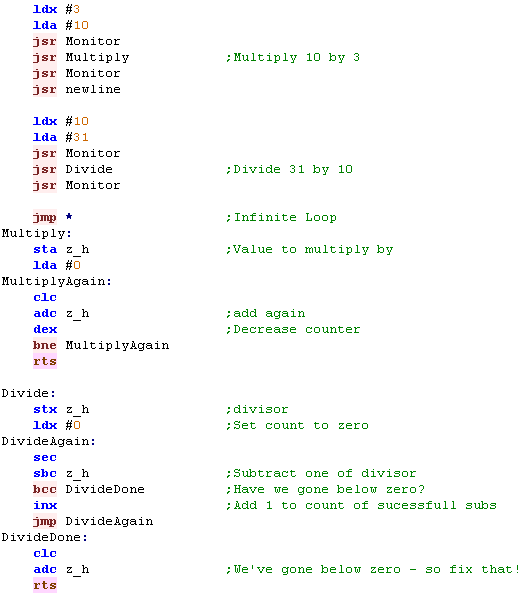 Because we don't have a DEC command for the accumulator, it's often easier to use X or Y as a loop counter. There are a wide variety of Branch commands for different condition codes. 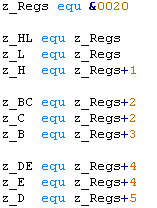 BEQ Branch if Equal flag Z=1 Is the result of the last command zero? BNE Branch if Not Equal flag Z=0 Is the result of the last command zero? 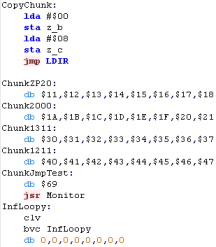 The result is that the monitor is called only when X=2... we've faked a 'Jump to SubRoutine on Equal' command... we can also do the same with a JMP to get further than 128 bytes away! Don't worry if you don't see any reason to do this - you may never need to! if you don't know why you'd need relocatable code - then you don't need it! That said, it will take a lot more work in assembly! Push me - Pull me! 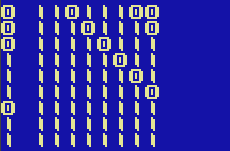 on the Z80 we have Push and Pop, but on the 6502 it's Push and Pull! We PUSH values onto the top of the stack to back them up, and PULL them off! 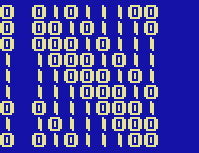 Our 6502 has 4 registers we may want put onto the stack A, X, Y and the 'Flags' ... unfortunately the basic 6502 can only directly do A and the Flags - so we will have to Transfer X/Y to A first ... but the 65C0C can do it directly. Let's try out the stack! We'll then clear all the registers - and pull them from the stack - it's important we pull them in the same order! Because the JSR and RTS commands use the stack to maintain the program counter, it's important that the stack is the same when a subroutine ends as it was when it starterd... ne need to ensure we pull everything off the stack that we pushed on at the start... otherwise some 'other data' will be mistaken for the return address - and anything could happen! The psuedocode for converting to positive to negative is to invert all the bits, and add one... or subtract the value from zero of course! We learned about using Labels for Jumps, and Symbols for values before... but symbols have another use! 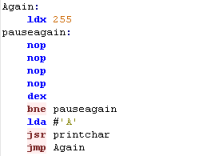 It's important to understand, it's not the CPU doing ths, the assembler simply skips over the excluded code - so it never appears in the outputted binary! This allows us to build multiple versions of a program from a single source, in fact it's how these tutorials support so many systems! To disable a definition we can just rem it out with a semicolon ; - we can even define symbols on the Vasm Command line! Subroutines are great - but there's times they may be too slow (because of the JSR/RTS) .... and if you want to do things with the stack, they may not be possible. Alternatively, we can use a Macro... this is a chunk of code that we can give a simple name... then whenever we use that name - the assembler will insert the code... we can even use parameters in the macro. Because the assembler does the work, it's faster than a call, but saves us typing all the commands... however it will make the code larger - so you will want to call to subroutines for big chunks of code where you can rather than use macros. 16 bits.. When 8 Bits aren't enough! The Carry flag stores the 'overflow' of an addition, or the 'borrow' of a subtraction. Note: many of the 'Printchar' functions use the same 'Z Page' values... so we're using a special 'PrintHex' function that backs them up. Of course it will be slower!... another option is 'floating point'... but that's a too complex to cover here! Other Tutorials may do things differenty, and if you don't like this way of using the Zero page, you should probably follow another tutorial instead. The Z80 and 6502 have something in common... they have no Multiply or Divide commands... yes, you read that right! There are faster ways of doing things - and we'll look at them later! You can see we've effected a simple Multiply and Divide command! 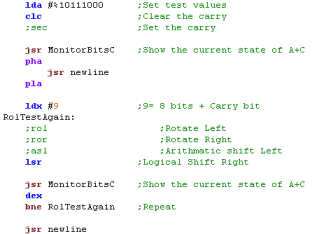 We've learned lots of maths commands, but we've still not covered the full range... this time lets take a look at how we can work with Bits on the 6502! EOR is nothing to do with donkeys... it means Exclusive OR... it will invert the bits of the accumulator with the parameter - it's called XOR on the z80! Lets try these commands on the 6502! We're using a 'MontiorBits' function, which will show the contents of the Accumulators bits to screen! 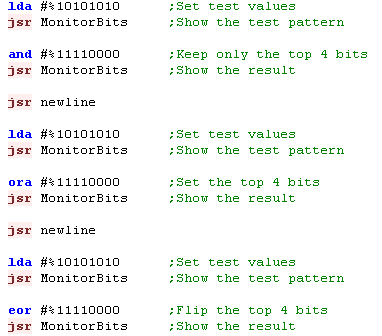 The bits of the test pattern will be altered in each case according to the logical command! One very important use of ASL/LSR is for halving and doubling numbers... our CPU has no multiply or divide commands, but effectively it can quickly do x2 or /2... and you want to try to take advantage of this when designing your code! We're going to test the shifting commands... we'll use a new testing function 'MonitorBitsC' will show the Accumulator and Carry flag. Then we'll see what happens when we use each of the rotate commands 9 times! So what does each command do? 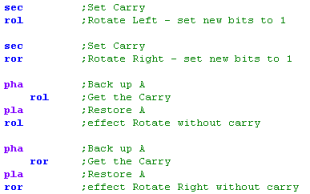 Well ROL rotates all the bits Left, the carry ends up in Bit 0 - and what WAS in Bit 7 ends up in the carry. ROR is the opposite... it rotates all the bits Right, the carry ends up in Bit 7 - and what WAS in Bit 0 ends up in the carry. 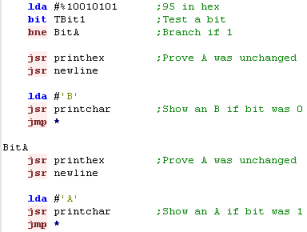 The 6502 doesn't have as many bit shift options as the Z80... but we can 'fake' others!. See Here for more examples of combinations of commands to effect the result you want. We're giving each of these a label, so we can use them easilly later. Hint: Try changing the TBit1 to a TBit0 in the example code! Specifying Addresses in this way will use 3 bytes per command - which is wasteful - if possible, it would be better to store these bitmasks in the Zero page, so we only use 2 bytes per command if we can. So you can branch on conditions relating to bit 7 and 6 without any more testing commands! NOP - Slacking in 8 bits! NOP (No OPeration) is a strange command... it does absolutely nothing! NOP's are more useful for self modifying code - we'll learn about that next time! Now we've learned all the basic maths commands, it's time to start looking at some clever tricks! 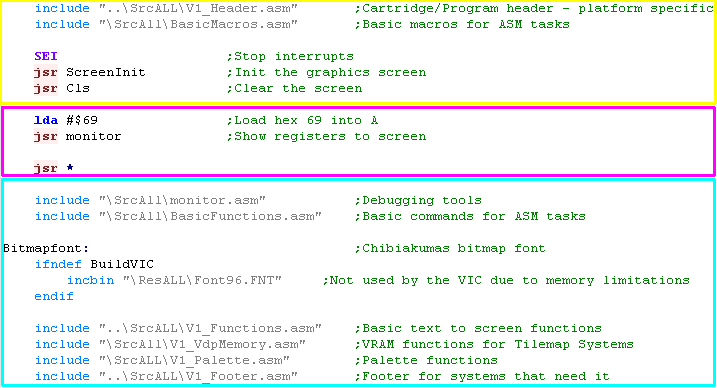 DB, DW and DS are assembler commands not 6502 opcodes... they will work in VASM and other assemblers, but depending on your assembler the commands may be different. Check your documentation if the commands do not work as you expect! 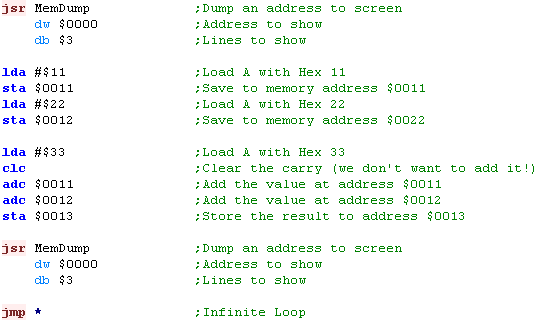 The 6502's Indexed addressing mode is perfect for this kind of work! We LDA sine,X to read in entry X from the sine lookup table! Our sine wave will be shown to screen... it's not very high resolution, but we could add extra steps if we wanted. The entries in a lookup table don't have to just be 1 byte it can be as many bytes as you want - though if you use X to read in the entries ... your total lookup table has to be 256 bytes in total, so if each entry is 4 bytes (2 words), then the Lookuptable can only have 64 entries! This is a table of 16 bit words... each of which is an address... we use our lookup table code to read in an address - then execute the data at that address! We need to define a function to execute a numbered command from this list . But if we want to be really powerful, we can process a 'CommandList'... with a set of numbered commands! If we want, we can use Symbols defined with EQU to give 'names' to these numbered commands! Vector tables have AWESOME POWER! 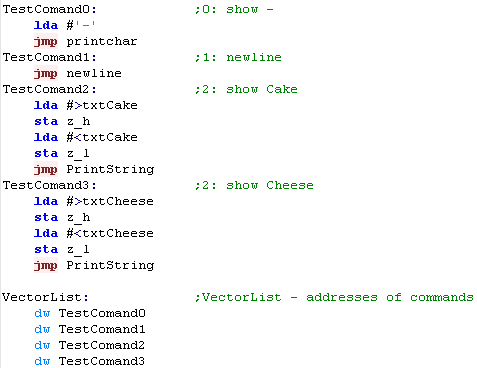 They allow us to turn a number into a executed command - in this case we've effectively created a scripting language!... because each command is just one byte... we could have hundreds of calls and save lots of space compared to sets of JSR's! 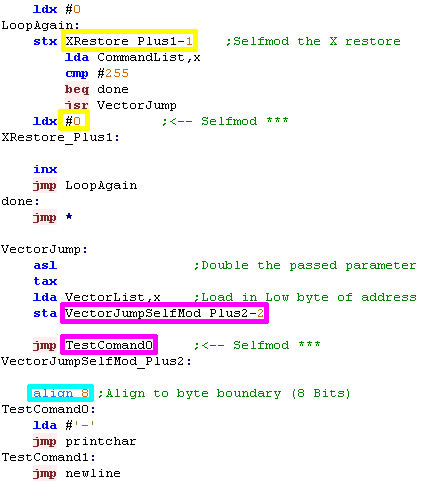 With VASM - the Align command takes a parameter which is a number of bits to align by - for example ALIGN 2 will align to a 32 bit boundary - and ALIGN 8 will do what we need - and align to a byte boundary - note, this command will be different on other assemblers. Self Modifying code allows for extra speed and saves memory - but it's complex and only works from RAM - so if your program is running in ROM it won't work. We can use vector tables to create 'modules' of code and execute them with a single call - with a 'parameter' which defines the command number - The calling code doesn't need to know the internals, so long as each numbered command does the same job it will work fine... this allows you to have different loadable modules, and the internals can change so long as the base call and functions of each numbered command does not.